Surely you remember August 7, 2010. You must. Fine, maybe you don’t know why you remember it, but you do. The date itself is not important, but what happened on that day is (or, at least, was) important. 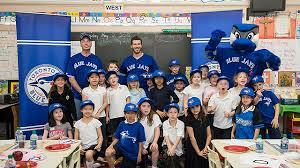 That was the day that Jonathan Paul Arencibia started his first ever game with the Toronto Blue Jays. He had been called up to replace the injured John Buck, who was having an excellent offensive year (he made the All-Star Team!). Arencibia responded to the “pressure” of August baseball in Toronto by smacking two home runs, a double and a single in a victory over the Tampa Bay Rays. The city was buzzing with the thought that the young catcher in our system was somewhere between Mike Piazza and Buster Posey. He could smash 30 home runs a year! He could hit .300! JP takes a curtain call, back in the good old days. Well, reality caught up pretty quickly. He spent two weeks with the big club in 2010, and only recorded one more hit after that first game. When Buck returned, JP was sent back to Las Vegas (this was before Buffalo became our AAA-affiliate). Fine, maybe he was not Piazza, but with some more seasoning in the minors, he should become a steady catcher who could put up numbers like .250/.300/.450. He had shown power in Las Vegas, finishing the 2010 season with 32 home runs and 85 RBI. It looked like we had the catcher of the future. JP began the 2011 season as the team’s starting catcher, while Buck was not re-signed and moved on to the Florida Marlins. The 2011 team featured Jose Bautista and Edwin Encarnacion, so Arencibia didn’t need to be an offensive juggernaut. 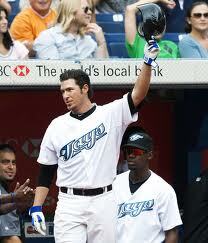 Expectations were high for Arencibia, with many fans still remembering that August 7th game. But that was never going to be Arencibia’s reality. His 2011 year gave us almost exactly what we expected, though perhaps a little less than we may have hoped: 23 home runs, 78 RBI. A split line of .219/.282/.438, not great, but still slightly above replacement level. On defense, on the other hand, Arencibia struggled. He ended the 2011 season with a Total Zone Rating of -8, essentially meaning that Arencibia cost his team 8 runs more, over the course of the season, than the average MLB catcher would have. He allowed 12 passed balls and only caught 24% of base-stealers, both below league average. However, the team was re-building and a young Brett Lawrie was exciting the city with his August call-up. Arencibia’s struggles went largely unnoticed. Arencibia quickly established himself as an outgoing, friendly, and funny person. He was often self-deprecating on Twitter and in interviews, he was well-liked by teammates, and he did a good deal of charity work with Sick Kids Hospital and other organizations. He was the kind of player you couldn’t really get rid of; fans liked him too much, and baseball executives knew his limitations. Over the course of the 2012 season, fans (especially those with knowledge of advanced stats) began to pick up on the quirks in Arencibia’s game. For one, his tendency to swing at sliders that dipped far outside the strike zone. He was doing it in 2011 too, but it was one of those “He’ll figure it out over time” kind of things that young players always tend to have. But he never really did figure it out. Over and over, in two-strike counts, a pitcher would toss a slider at JP, and JP would go fishing for it. His batting average improved, but that’s a misleading figure. His OBP and SLG% both dipped. On defense, Arencibia actually improved in 2012. He was still not a great catcher, but he caught a higher percentage of base-stealers and his Total Zone Rating jumped to a +4. Defensive metrics are funny things though; they can fluctuate wildly from season to season depending on the situations a defender finds himself in. JP also missed about 30 games with injury, so had he played a full season, he would have had more opportunities to either improve or regress in his fielding. The scary notion at the end of 2012 was: had JP Arencibia, at 26 years old, already peaked? We all know that 2013 was supposed to be a BIG year for the Blue Jays. Alex Anthopoulos spent millions of Rogers’ dollars to bring in RA Dickey, Jose Reyes, and others. Game one of the season magnified a glaring issue; JP was a poor defensive catcher, and he couldn’t handle Dickey’s knuckleball. Again and again, we watched the ball squirt, bobble or drop out of Arencibia’s glove, and within about a month or so, the entire city of Toronto, and other baseball observers seemed to come to a realization: we can’t win anything with this guy as our catcher. In 2013, Arencibia has seen dips in his Batting Average, OBP and SLG% (.225/.258/.422). He can still hit home runs (he is on pace for 25), but he strikes out so often and walks so rarely that he more often hurts the team than helps. His defensive numbers are back in the minus range, and backup Josh Thole has taken over catching duties for Dickey. So our number one catcher can’t catch for our “ace”, meaning he misses every fifth game automatically. Catchers usually take more days off than other fielders, due to the rigours of the position, but it does hamstring a manager to some degree. For example, if Dickey is starting for the Jays, and the opposing team has a left-handed pitcher starting, that means the left-hitting Thole has to face left-handed pitching, where he will probably struggle (and has). But wait, catchers are usually not offensive powerhouses, right? 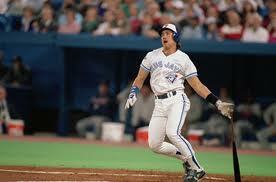 How about everyone’s favourite Blue Jays catcher, Pat Borders? He won the 1992 World Series MVP, and is widely considered our franchise’s best catcher ever. How do his stats compare with Arencibia’s? Pat, were you fooling us all along? Interesting. 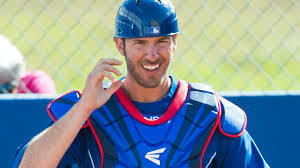 It could be argued that Arencibia’s 2013 season, in which he has become the scapegoat of the Toronto sports world, is only slightly worse than Borders’ best season. Of course, no one was complaining about Borders in 1992 because the team was winning games, and his glaring offensive holes were not as detrimental. Maybe sympathy isn’t the right word, but you’ve got to at least understand why Arencibia might feel unfairly treated. OK, I’ll admit it, JP is a handsome dude. If I had a daughter, I’d want her to date JP. He and Lawrie have helped the Blue Jays build up a notable female fan base. But is that all that Arencibia can provide? Has he just used his charisma and good looks to slide his way to the majors, sort of like the Frank Abagnale of the MLB? He definitely appears to be in over his head in the majors, but his stats appear too good for AAA ball. Perhaps he is doomed to be one of those “AAAA” players, who are good enough to get out of the minors, but for whatever reason can’t adapt to Major League-level pitching. A few days ago, Arencibia deleted his often-entertaining Twitter account, and he has been complaining to management about all of the negativity directed at him and the team from the media and fans. He has even feuded, publicly, with former Blue Jays catcher, current TV analyst and Mitchell Report participant Gregg Zaun, and his Sportsnet partner Dirk Hayhurst. The fact is, none of the criticism has been personal (I’m sure there were some moronic Twitter users who were making it personal, but they don’t represent the majority). His charity work is still admirable, and the ladies still love him. But his struggles, and regression, are professional criticisms that need to be made, particularly with the collection of talent this team currently has. It is a part of life in the major leagues, and if JP thinks what he’s been hearing this year is bad, he should consider himself lucky he wasn’t drafted by the Yankees or Phillies (or by the Toronto Maple Leafs, for that matter). This is starting to feel like a break-up that was long overdue. Most fans are moving on, and Arencibia seems ready to do the same. He is in the last year of his contract, but prospect AJ Jimenez isn’t quite ready for the Majors just yet. Anthopoulos could offer JP a short extension through arbitration, but with a roster that was put together to win in the next two seasons, that would be an odd move. If Rogers/MLSE are willing to open their wallets again, adding Brian McCann would make a lot of sense for next season, or, for less money, Jarrod Saltalamacchia. Either would be a huge upgrade over Arencibia, and assuming a healthy roster playing at their normal skill levels, the Jays with a new catcher in 2014 should be in an even better spot than they were back in April.